Performing on Broadway is the dream of millions of actors around the world. At New York Film Academy’s 4-Week Musical Theatre Camp for teens, we prepare the next generation of musical theatre performers for The Great White Way in a unique environment. 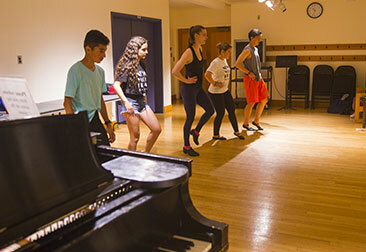 At the New York Film Academy’s musical theatre camp for teens, campers work one-on-one with Broadway professionals to hone their skills in song interpretation, tap, ballet, jazz, and how to present themselves professionally in auditions and performance. NYFA camp instructors have recently or are currently working on regional tours, national tours, or Broadway shows of: Finding Neverland, Beautiful, Phantom of the Opera, If/Then, Matilda, The Lion King, Book of Mormon, Cinderella, Chicago, and the Hunchback of Notre Dame. Each student will be guided to work in solo, duo, and ensemble songs and scenes that point them to their highest potential, instill a sense of confidence, and allow them to shine. Our 4-Week Musical Theatre Camp is designed for individuals with varied levels of singing and movement ability who want to elevate their existing skills to a professional level while making lifelong friends from all over the world. Courses from the following list allow students to explore the integral skills required for success in the field, to understand professional ethics, and to prepare themselves for the joys and demands of musical theatre. • Acting Technique: Students are introduced to the tools necessary for strong storytelling including given circumstances, objectives, obstacles, tactics and actions through the use of theatre games, exercises and practical performance analysis. Our Broadway-level faculty provides a fun, safe, and nurturing environment to explore and apply these tools. • Ballet, Tap, Jazz & Theatre Dance: Working with Broadway’s top talent, students of every level are exposed to fundamental dance techniques including jazz and theatre dance, ballet, and tap. Our programs place a strong emphasis on core strengthening, flexibility, and story through movement. Using material from musical theatre, students learn an ensemble piece musically and then proceed into a fully choreographed dance sequence for final presentation. • Voice Studio Lab: This course will give students an understanding of the voice and its physical components as applied to musical theatre. Students work on fundamentals of healthy singing: breath support, articulation, relaxation techniques, alignment and proper construction/placement. 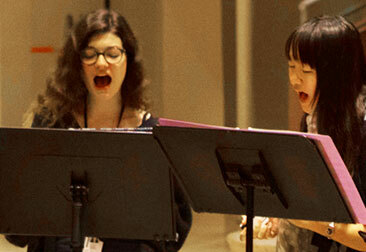 • Performance Lab: Students are immersed in the works of individual composers and lyricists. Class is a survey of the works and styles of major musical theatre artists including: Stephen Sondheim, Andrew Lloyd Weber, Jerry Herman, Cy Coleman, Cole Porter, Rodgers & Hammerstein, Bock & Harnick, Lerner & Loewe, Ahrens & Flaherty, Maury Yeston, Kander & Ebb, and Leonard Bernstein. This lab is designed to workshop musical scenes or group projects for performance at the end of the session. Work becomes more complex over the course of the session and requires that students take on both leading and ensemble roles in performance. • Professional Show and Backstage Tour: Students will attend a Broadway musical. In some cases, when circumstances allow, a backstage tour and/or a conversation with members of the company is arranged.